You tell it like it is! Interesting stuff, to be sure. Look out for our next poll on my blog on Friday when I tell you about the next exciting Oxygen special collector’s issue. Ever wonder what happens when we head outdoors for a shoot? In a word, we all work on the fly – the model’s make-up is reapplied quickly, lighting gets adjusted and wardrobe changes often occur, well, in the strangest of places! But we always make it work! Take a look at how model Fran Dennis adapts to outdoor circumstances by using a portable change tent – in a flash she’s ready for the camera! "I finally got up off this couch!" Thanks again for all the messages from all of you! Here’s a letter I wanted to share with you from a reader who has transformed her life in the best – and most sustaining – way…step by step. I love hearing from you! Let me in on your story here. I have to say I’m stoked these days – my clean eating is on track, I’m back to regular workouts after a bout of bronchitis and, truth to tell, I actually got some sleep this weekend. As we face the upcoming Thanksgiving holiday, I’d like to encourage you to stay Off the Couch! by choosing good clean food, staying active with the family and getting in some rest. I’m learning, finally, the value of rest – of being good to myself and taking some time out of a busy schedule to connect with friends and family. Holidays can be a brutal time for your clean-eating and exercise regimen – but it doesn’t have to be that way. Think about modifying your routine, making better food choices and doing what I’ve finally learned to be invaluable to my health and fitness goals – sleep. Be good to yourself and everything else will follow. Let me know how you’re doing to get ready for Thanksgiving – how about sharing a few of your favorite tips and strategies? One of my favorite articles in the magazine is this one, a comprehensive guide to getting started on the Oxygen lifestyle of regular exercise and clean eating. And a major reason it works so well, I think, is because it’s packed with all kinds of information and inspirational tips...just perfect for the beginner! Plus, it’s because of you that we could add results from our reader’s poll. Flip to page 62 and you’ll see the reasons many of you got hooked into fitness. Do your long term goals seem overwhelming? Often, I find them daunting and that's when I turn to other people to see what they've done. Oxygen's Off the Couch! cover gal Amy Barnes, for instance, had an inspirational weight loss journey that took almost five years (and 339lbs!). Amy set herself up for success by working at it slowly. Check out this video for more of her tips on how to stay motivated! Let me know what you think. This weekend Oxygen’s Off the Couch! cover gal Amy Barnes is doing something she’d never thought possible – getting on stage to compete in a fitness show. You’ve got to love this woman’s zest for new challenges – as if shedding 339 lbs weren’t enough! She’s now going to compete in front of others this weekend! And this from someone who never wore exercise shorts in her adult life; this from a woman who stared at the clothes for her cover shoot wondering how the heck she was going to pull off a bathing suit and workout wear. But she did it! I have every confidence that she’ll get on stage and do terrifically well. This inspiring woman is not one to shy from new experiences. Good luck Amy! And on a special note: Check out Amy on The Today Show November 9! I've been training for more than eight years, and although I've maintained my weight, I feel like my muscles aren't as toned as I'd like. I'm 5'6" and weigh about 145 lb. I have a bad knee with bone on bone and it's difficult to work my leg muscles, but I'm getting there. How can I keep motivated to work out strong without thinking that I'm just not going to get where I want to be? I still feel good after a workout and I have a trainer to help with my knee while I await possible surgery, but I've lost my motivation. I hate to admit it, but I am the least patient person when it comes to injuries...I just keep plowing along! But I learned a harsh lesson a few years ago when I sustained my first concussion – I kept trying to get back to my workouts but always had to stop, repeatedly, because I was simply trying too hard and moving too soon. It was a hard lesson to learn, but I know now to come back slowly and take my time after an injury. So, Karen, let me first tell you to seek medical advice. Then, do what I did when I was injured – be good to yourself and don’t rush back too quickly. 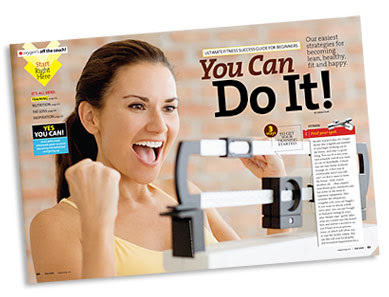 Finally, read the real-life motivational stories in our Oxygen Collector's issue, Off the Couch! You'll get loads of inspiration, believe me! Motivation comes from within, ultimately, but reading inspirational stories of women from across the country just might help too! How else do you stay motivated? Let me know! Note: In a previous blog posting, I told you all that you can buy Off the Couch! here if you don’t see it on stands in your city or town. What I didn't know is that that link only applies to our North American readers. Sorry! If you live overseas, please email sales@emusclemag.com to get a copy. PLEASE NOTE: Opinions on this or external websites linked from this website are not necessarily endorsed by Robert Kennedy Publishing. Readers are advised to consult their physician before beginning or adding a new fitness regimen or changing their diet. Oxygen does not accept any responsibility for injury sustained as a result of following the advice or suggestions contained within the content of this website.